In business for over 30 years, Arlyn Scales prides itself on customizing scales for industrial use, no matter how complex the need. With our experienced engineers and technicians we have come up with solutions for every aspect of industry weighing, and continue to expand the parameters of possibility with new equipment as demand requires. The many applications for platform scales are discovered in the airline industry, where they are used to weigh luggage, the agricultural industry where they are used to weigh farm animals, veterinarian offices where they are used to weigh domestic animals, manufacturers using shipping and receiving protocols, as well as in the industrial, medical, scientific, and similar arenas. Platform scales are ideal for weighing cylinders and drums containing water, wastewater, and caustic chemicals such as sulphur, ammonia, fluoride, and chlorine. As one of the most commonly used weighing devices, low profile platform scales continue to dominate as they are used in a myriad of instances that require a surface that is easy to reach, especially when it comes to heavy loads. The beauty of a low profile platform scale is that it is easily accessible when it comes to loading elements that are difficult to place on other types of weighing equipment. Arlyn Scales has designed the Series 3200 platform scale as the lowest profile in the industry, making it easy to get items on and off the scale. With their ability to hold up to 500 pounds with one model, or up to 1,000 pounds with another, these scales are capable of handling any given situation where a low profile is essential for stability, ease, and accuracy. With its mere 1 7/8 inch high measurement, these low platform scales make it easy for items to be lifted onto their surface. If lifting is not an option, they are designed to accommodate a ramp, whereby items can be rolled on and off with no danger of compromising the precision involved in the weighing process. Because the ramps can be attached with anchor plates that maintain a small gap between the scale, they do not affect the weight of the load. Many commercial ramps are placed too close to the scale, pushing up against it and thus compromising accuracy. With our usual attention to detail, our engineers have devised a way to prevent this from happening. In many industrial settings, floor space is an issue. Many scales take up too much room, especially when it comes to platform models where they are too high, requiring a ramp that angles higher and a longer length. 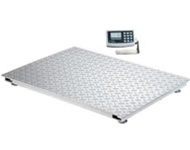 The Series 3200 scales are low enough to warrant a shorter ramp due to covering less incline space. Perhaps the most essential issue when it comes to any type of scale is its ability to withstand heavy weight, corrosion, and the shock of heavy weights descending to the surface. In the case of platform scales in particular, this is always a problem when they are constructed with a minimum of load cells. Many industry platform scales are made with only one load cell located in the center, which is not sufficient for handling conditions that create enormous wear and tear on the equipment, especially when the scale is being used frequently, as is the case in normal manufacturing settings. Arlyn Scales understands the need for scales that stand the test of time and have made all of their models strong enough and technologically advanced enough to last, undamaged. The construction of our low profile platform scales includes an embedded stainless steel load cell in each corner, creating a totally stable environment for any weighing necessity. An industrial climate implies intense conditions, whether it comes to dropping heavy weights onto a weighing surface, corrosive elements that can eat into equipment, or other factors that compromise the integrity of a scale. Arlyn recognizes that when you buy one of our scales, you are making an important investment, and we want to make sure that this is substantiated by making the ultimate in durability. In the case of possible corrosive effects, scales can be coated with epoxy enriched with zinc that prevents disintegration in harsh conditions. By adding this feature, equipment is also spared damage from extreme exposure to sunlight. The rugged construction of an Arlyn scale is aided by the presence of the four load cells in each corner of the device. Because there are four load cells rather than only one, this permits each one to be smaller than conventional models, which helps to keep the platform lower to the ground. The thinness of the stainless steel from which the load cells are made also helps to lower the height. When four impressively strong load cells are present in one platform, the result is a scale that is completely shock proof when it comes to dropping heavy loads onto the surface. Our platform scales are particularly designed to tolerate high levels of overload that often occur, preventing the scales from becoming compromised or damaged in any way. When a load is shared between four load cells, the weight can be calculated more accurately than with just having one. The use of stainless steel in the cells construction also guards against any type of malfunction that can occur when weighing heavy loads that, with conventional platform construction, can cause damage when items are dropped. Because the signals created from each load cell are combined to provide the total weight of the item, an ultra precise figure can then be conveyed through a digital display. Arlyn Scales has designed a digital graphics display for optimum read out. Placed on a swivel-type mount, this display is surrounded by a rubber gasket that protects it against damage from liquids. With its pushbutton functions, the unit can calculate conversions in multiple units, such as in pounds, kilograms, ounces, and the like. With a highly developed memory bank, it can store data that is compatible with computers, printers, and the Internet. The equipment is available with special software to assist users in taking advantage of the device to create reports and record information in real time. Perhaps one of the reasons why Arlyn Scales has become the leader in the industrial weighing industry is the care we take in making sure your reputation and productivity are enhanced through accurate details via our equipment. With no moving parts that can malfunction and the ability to build scales in custom sizes to fit any need, our equipment is a definite asset when it comes to increasing productivity and accuracy on any job. For more information on Arlyn’s low profile platform scales and more, you can contact our representatives by calling 800.645.4301 or through our online form, which can be found here.